Comment or share this post! Discover five reasons why Battery Discharge occurs and learn to understand the Battery Discharge Curve and the different Charge Stages of a solar battery. A battery is an electrical component that is designed to store electrical charge (or in other words – electric current) within it. Whenever a load is connected to the battery, it draws current from the battery, resulting in battery discharge. Battery discharge could be understood to be a phenomenon in which the battery gets depleted of its charge. Greater the current drawn by the load, faster the battery discharges. Battery discharge during idle status? Battery discharge also occurs when the battery is idle. A battery is said to be idle when it is still connected to the load, but there is no current being drawn from it. The voltage of a lead acid battery when idle (not supplying current or being charged) will vary according to how fully charged the battery is. 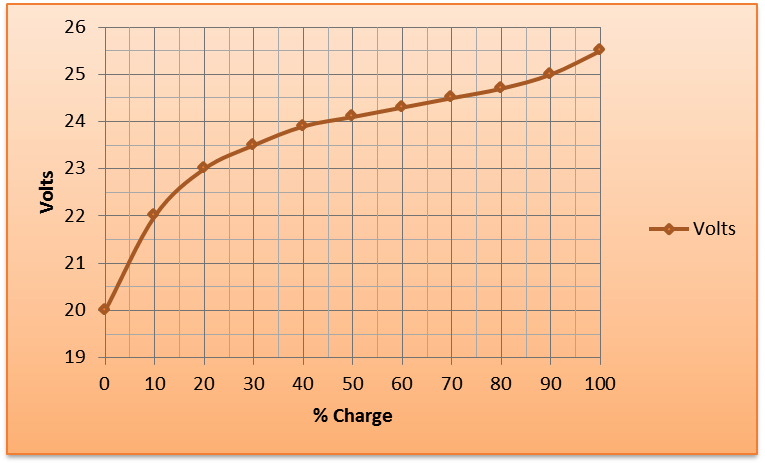 The graph shown below represents the discharge characteristics (voltage versus charged percentage) of a typical 24 V lead acid battery, which has not been charged or had current drawn from it for few hours. For the 24V lead acid battery example shown in figure 1, a battery which is 100% charged will have an output voltage of around 25.6 volts. At 50% charged stage, the output voltage of the battery is around 24V. Once the battery is 30% discharged, the discharge rate of the battery picks up sharply to a complete discharge. Range between 80% to 100% yields above rated output voltage, but the voltage drops quickly. The battery could be charged up to 100% if the load requires a voltage boost for a short amount of time. Range between 40% to 0% is the most unstable zone and it witnesses a sudden drop of voltage. The battery shall not be ideally operated in this range. Operation of battery in this range could harm the battery and significantly reduce its life. It’s common for an inverter to be programmed in such a way that the battery will be disconnected when the output voltage is around 22 volts. Different types of batteries (and sometimes, even the same type) show different discharge characteristics. First it’s best to know how many amps you usually use, then have a battery bank large enough to cover the usage for 2-3 days. Also have a large enough solar system to replenish your daily usage + 20% to completely recharge the battery bank. Sinovoltaics Ranking Report, Edition 2 – 2019: which PV manufacturers are financially strongest? Sinovoltaics Ranking Report, Edition 1 – 2019: which PV manufacturers are financially strongest? Sinovoltaics Ranking Report, Edition 4 – 2018: which PV manufacturers face bankruptcy?